The first sign that you have fallen in love with pastry is when it takes you four hours to finish and then the next day it’s all you can think about. Let me be clear though, this was no ordinary pastry. I don’t fall in love with pastry on a whim. I’ve had a few pastries in my time and i’m not fickle enough to fall in love with each one. This particular pastry had me add hello. 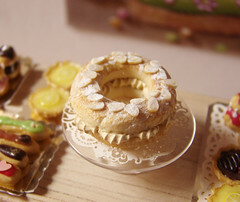 A large base of choux pastry with a creamy delectable custard filling, chocolate shrapnel baked into the pastry, a moreish meringue topping decorated with slivered almonds and dusted in icing sugar. I remember it like it was yesterday. Probably because it was only yesterday. The Bordeaux Bakery in Wellington call it a Royale but the closest i could find on Google was the Paris Brest. I’m not entirely sure it is the same thing but after at least an hour of searching it was as close as i was gonna get. 1) Place milk, cream, and vanilla in a medium sauce pan and bring to a boil. 2) Meanwhile, whisk together the egg yolks, sugar, and corn starch. 3) Remove the milk form heat and carefully whisk in to the egg yolk mixture. 4) Return to the pan and to medium heat, stirring constantly, just until combined mixture begins to boil. 6) Stir in the gelatin and transfer the mixture to a shallow bowl, discarding the vanilla pod. 7) Allow to cool and then stir in the butter until incorporated. 8) Store tightly wrapped, under refrigeration. 1) Place water, milk, butter, and salt into saucepan and bring to a full rolling boil. 2) Add the flour and cocoa all at once to the boiling mixture. 3) Stir with wooden spoon or heatproof spatula until a smooth mass forms. 4) Keep cooking and stirring it around over moderate heat to dry out the dough as much as possible, about 2 to 3 minutes. 5) Transfer dough to mixing bowl. With the paddle attachment, beat at medium speed to release steam and cool a bit for one minute. 6) At low speed, beat in the eggs, one at a time, beating until incorporated between additions. 7) The dough should look smooth and glossy. 1) Transfer cocoa pate à choux dough to a pastry bag with a plain tip and pipe out as desired. 2) Beat one egg yolk with 1 ounce water to make an egg wash.
3) Liberally sprinkle the sliced almonds over each puff. 4) Place in pre-heated 400 degree F oven for 10 minutes, then turn oven down to 300 degree F to continue baking for about 20 minutes more, until the interior of each puff has begun to dry. 5) Meanwhile, combine butter and praline paste in a mixer bowl and whip until thoroughly combined. Slowly add pastry cream. 6) Briefly chill the mixture while the choux puffs cool. 7) Split each choux puff in half; place the praline mixture into a pastry bag fitted with a small star tip. 8) Pipe a ring of the filling onto the bottom of each puff and gently replace the top. 9) Dust with confectioner’s sugar.